The most potent jump shot in the NBA might belong to Atlanta’s Kyle Korver.1 The Hawks deadeye ranks first in the league in 3-point percentage and second in 3-point production, and through 24 games he’s shooting a ridiculous 54.6 percent from beyond the arc. In other words, any Hawks possession ending with an average Korver 3-point attempt is worth a ridiculous 1.64 points. Considering that the league as a whole scores 1.04 points per possession, it makes sense that Korver has become the centerpiece of a Hawks attack suddenly surging up the Eastern Conference standings. Korver will never lead the league in scoring, but along with guys like Steph Curry and Danny Green, he’s among the NBA’s leaders in scaring; the mere risk of Korver getting off a clean shot terrifies opponents, and the defensive respect that terror commands opens the floor up for his teammates. As Zach Lowe pointed out in July, this effect is now measurable, and the numbers back up the notion that Korver receives more defensive attention than almost anybody else in the NBA. Looking at his shot chart from last season, it’s easy to understand why. The guy launches fireballs — everybody knows that — but until recently, the Korver threat had never been fully realized. This year, Atlanta coach Mike Budenholzer has designed all kinds of tactics to ensure Korver gets his looks, and the knock-on effect has been clear. Overall, the Hawks are scoring 105.2 points per 100 possessions, which ranks 10th in the NBA. But during the 33 minutes Korver averages on the court, they put up 109.7 per 100, which would rank fourth in the league and second in the Eastern Conference. I asked How U, YouTube’s greatest NBA compiler, to help demonstrate Korver’s importance to the Hawks offense. As you can see, the simple wide screen doesn’t always get Korver a good look, but even when it doesn’t, the defense gets stressed early in the possession. Among players averaging at least 30 minutes, Korver has the fourth-best net rating in the Eastern Conference. Part of that is directly tied to his freakish ability to knock down 3s, sure. But he scores only 13 points per game, so it’s his mere presence that opens up the floor and keeps Atlanta’s offense humming. The above play — the backside handoff — looks downright Spurs-ian, and it may as well be Manu Ginobili taking a handoff from Tim Duncan or Boris Diaw. That’s no coincidence of course, as Budenholzer served as an assistant in the Spurs organization from 1996 to 2013 before taking the Hawks gig last summer. He knows what smart basketball looks like, and he deserves a ton of credit for designing and implementing a new motion offense that evokes San Antonio’s movements and has quickly become one of the few watchable NBA things east of the Mississippi River. Despite a 17-7 start, it’s too early to tell just how good the Hawks are. However, it’s clear how much the team has improved under Budenholzer — and since Al Horford returned to action. Atlanta is one of the few teams that effectively tailors its offense to emphasize its roster’s unique strengths, and all five starters are averaging double figures. With such a uniquely balanced attack in the cesspool that is the Eastern Conference, who knows? 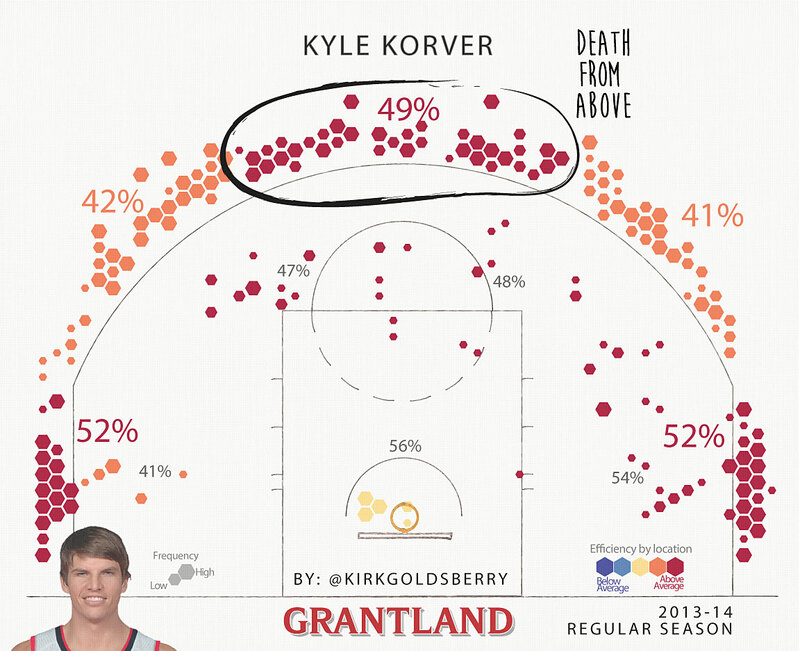 Korver might be scaring defenses all the way into June. I say “might” because the league includes Stephen Curry, and I would love to watch these guys play H-O-R-S-E to settle this debate at All-Star Weekend. Kirk Goldsberry is a professor and Grantland staff writer. Will the First Major Sports League in Vegas Really Be … the NHL?